Well, it’s now available on Amazon (http://amzn.to/1A25mMV) and I would love for you to enjoy the fruits of my labor, so to speak. 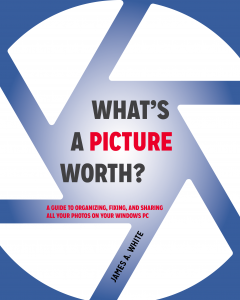 I put over a year into writing this book because I know that you most likely have a lot of digital photos sitting on your computer gathering computer dust. What’s a Picture Worth? will guide you in how to take all those pictures, and use some tricks and software to organize and rename them more efficiently than you could otherwise. By tagging your photos, you’ll be able to instantly find any photo you want. I’ll also show you how to correct your photos to make them look better. Then I’ll help you to find better ways to share and show off those photos instead of leaving them to sit on your computer with no one to enjoy them. I’ll tell you some better ways to back up your photos so you never lose those precious memories. And finally, I’ll show you how to collaborate on events like vacations or parties to make it memorable for everyone. Head on over to http://amzn.to/1A25mMV to get your copy today and thanks for your support! !